Posted 9/9/2011 5:53pm by Vicki Phillips. We returned earlier this week from a great family getaway in Hilton Head. While there I was reminded how much better our vegetables have been this summer coming straight from the Chatfield garden. On our last night in Hilton Head it was our turn to cook, so we went to the nearest store, a large grocery chain, for some country pork ribs, broccoli and potatoes. Back at the beach rental house, we started cooking the broccoli by steaming it. But when the grilled pork was nearly done and the broccoli had miles to go, we resorted to drastic measures. The broccoli got plunked in boiling water for 5 or 10 minutes and still it was not cooked to my liking. Ditto with the potatoes. They baked for an hour at 450° and never did get fluffy and soft inside. Now, I don’t expect store-bought veggies to be as young and tender as our CSA goodies, but this broccoli and potatoes seemed particularly old and tough. So when I returned home and picked up my CSA share from neighbors Teri and Debi, those fresh-picked tomatoes, broccoli, peppers and potatoes were a sight for sore eyes. Before leaving town last week I delivered my unused share to Fred & Barb and Alan & Deb. They made good use of nearly everything, with only some potatoes left for roasting. Squash and zucchini were fried up with a nice herb blend. Tomatoes and sweet peppers were dropped into a salad with green olives and topped with shish kabob chicken. Heirloom tomatoes, hot peppers, garlic and tomatillos combined for a lively salsa. Even Fred was stumped by the fennel. He consulted with his friend Steve, who turns out to be Italian and uses it all the time. So Fred found a way to incorporate it into one of his magnificent meat dishes. In his words, "That root thing we peeled and sautéed in butter and garlic to serve with grilled lamb chops." I rarely turn on the TV in the morning, but yesterday morning it was on, tuned to the Food Network, of course. I was busy with chores so wasn’t watching it, but Ellie Krieger caught my attention with a vegetable tart. I sat down and watched her make the whole thing. "I have all those ingredients!" Last night for dinner I made the tart using our eggplant, tomatoes, zucchini, purple onion and basil. With five CSA items in one healthy dish – and succulently delicious besides – I definitely hit the sweet spot where flavor meets nutrition. The dish is called Cornmeal-Crusted Roasted Ratatouille Tart. I should watch Ellie Krieger’s show more often. As a dietitian, she’s always mindful of minimizing fat, salt and other naughty ingredients while maximizing use of vegetables, fruits and whole grains. Perfect for us CSA shareholders! Posted 9/9/2011 12:18pm by Josie Hart. This is the last reminder to please bring in the member surveys to distribution if you still have not done so. We appreciate all the emails from members that have shared a thought, idea, link or recipe for the way we do things. Please feel free to contact us with ideas anytime! Overall, the feedback from the survey has been overwhelmingly positive, constructive and reaffirming to our CSA staff. We thank you for being a part of our community, taking the time to step outside the “produce box” and share in our summer bounty of good food, friends and health. There are various crops that have slowed down significantly with the cooler mid-September weather. Members should expect to start seeing a lot fewer cucumbers, summer squash and tomatoes. The majority of the heirloom tomato varieties have recently have been affected by the cooler weather and possibly a pest affliction that is still being researched. The bulk of the tomato harvest will shift to different types of winter squash such as acorn, butternut, delicata and spaghetti. We hope you had a chance to use all the slicing tomatoes for some pasta sauce or salsa! The basil crop has also been affected by the cool mornings causing the leaves to slightly yellow in color, but the flavor should be fine. Other crops that are almost finished include potatoes and melons. We will have a new arrival of leeks, and fall greens like spinach and kale that will sweeten up in the cooler weather. In a bowl, mix the mayonnaise, minced garlic, and lemon juice. Set aside in the refrigerator. Preheat the grill for high heat. Spread some of the mayonnaise mixture on the cut sides of the bread, and sprinkle each one with feta cheese. Place on the grill cheese side up, and cover with lid for 2 to 3 minutes. This will warm the bread, and slightly melt the cheese. Watch carefully so the bottoms don't burn. Remove from grill and layer with the vegetables. Add two slices of avocados on the top and enjoy as open faced grilled sandwiches. Working on a farm, there are several aspects of the land, plants and the overall community that continue to amaze me. Personally, there are many parts of growing food that I find fascinating. The variety and vividness of the colors of the produce is one of the most exciting parts of the farm. To see the different varieties of eggplant - and how beautifully the purple and white vary - proves to be truly wonderful every time we harvest! The peppers are another example of the great colors found on the farm. The bright greens, yellows and reds are simply stunning. The colors and varieties never fail to bring excitement to any farmer, whether it’s the first or the hundredth pepper that day. Another fascinating part of working on a vegetable farm is the incredible resiliency of the plants. Not having much prior experience with growing, I came in with the notion that one has to be delicate with the plants for fear of breaking them or exposing them to harmful conditions or outside factors. Over the season, we have dealt with pests, excessive rain (and therefore, weeds), intense sun and wind, as well as human contact, which can be rough or invasive. Our crops have prevailed through all of these things and have in fact, thrived! Of course, sometimes nature gets the best of the plants, but this year we have successfully avoided any major catastrophes. This has taught me that I don’t need to be so cautious and can take risks when it comes to gardening and growing my own food. Overall, there are many parts of this farm, and growing food in general, that have come to amaze me and allow me revel in the beauty of nature. As a society, it seems that we have allowed ourselves to become very isolated from growing food and understanding the natural process of how we sustain ourselves. It has been so interesting and fulfilling to see the connections between humans and this natural process through working at Chatfield. Growing food is a natural process that can work wonderfully, and when it does it becomes something that can bring great pride, excitement and an overall sense of connection to something much bigger than us as individuals: a community. Posted 9/2/2011 2:30pm by Josie Hart. We hope you are enjoying all the beautiful tomato varieties! From the dark prince heirloom to mountain princess to striped Germans, they all have their own unique flavor and colors. 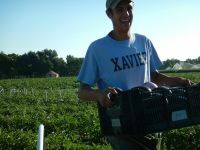 Last Thursday we harvested close to 1,500 tomatoes on one single day! To everyone who filled out a member survey and sent it back in - we thank you. We still need to get quite a few back so we are sending the link again, but we also will have hard copies at distributions for your convenience. This week, Susan Evans from Chrysalis Herbs will demonstrate how to make gazpacho, a delicious cold soup recipe that uses many of this week’s veggies. Gazpacho stays great for days in your fridge and provides a nice cool snack for hot summer days. Susan will be at the York St. distribution from 4:30 to 5:30 p.m. with plenty of gazpacho to sample as you pick up your share. We will also have fresh cut bouquets, so please bring $5 cash. Cut the chilies in half lengthwise and remove the seeds and white ribs. Slice them thinly. Add to the apples. Add the onion, cilantro, walnuts, ginger and salt and mix thoroughly. This apple salsa goes great in panini sandwiches, on the top of pork chops and grilled chicken, or on just about any cracker and cheese combo. Growing vegetables is certainly no easy job, and here at the Chatfield CSA we need all the help we can get! With the staff/acreage ratio being at 1.5 people per acre, we certainly depend on our volunteers to make the harvest and distribution happen twice a week. We would like to take this moment to thank all of the volunteers who join us every week at all hours – harvesting, washing, counting, scrubbing, weeding, digging and carrying. We have volunteers that get a discount on their share price for helping each week. The CSA will be adding new people to this team; if you or a family member is interested for next year please let us know. The staff in the field had a fantastic volunteer day last Thursday and we really appreciate the quality of help. There are volunteers that don’t receive a discount, but show up every week because they are dedicated and have a sincere appreciation for farming. Great work, everyone! Soon we will announce the details of our volunteer appreciation extravaganza. If you are interested in becoming a CSA volunteer, please contact us at chatfield.csa@botanicgardens.org. On Sept. 10 and 11 Denver Botanic Gardens at Chatfield will host the 3rd annual Local Foods Festival. The festival provides a fun, energetic and inspiring atmosphere for families to learn more about Colorado food resources with tastings and various lunch options from local restaurants. The CSA will have a booth selling cool season vegetable starts for your fall garden. If that doesn’t sound tasty enough, the Local Foods Festival will coincide with the opening of the very popular Denver Botanic Gardens Corn Maze, opening on Sept. 9 - one of the largest of its kind in the country. Make a day of it! Attend the Local Foods Festival and make your way through the Corn Maze (separate admission fee). Posted 9/1/2011 10:47am by Vicki Phillips. After two weeks of extolling the virtues of plain, simple preparation of our CSA vegetables, I reverted to old ways and indulged in cooking an elaborate gourmet meal. What occasioned the turnabout was the visit of friends Nicki and Pat from Australia. They did come all the way from Down Under, after all, so something exceptional was in order. Once again drawing from the Ina Garten well, I found a great recipe for loin of pork with fennel, whipping up a sage-thyme cream gravy to accompany the meat. I also found a gem of an idea for fork-crushed purple potatoes published a few years ago in New York Magazine. The article said purple potatoes were developed with cross-breeding techniques in Colorado … who knew?! Rounding out the main course was a salad using cherry tomatoes, salad mix, arugula, snap beans and Thai basil. Oh, and for appetizers we had Caprese salad and bite-size pieces of that ripe, juicy cantaloupe. All in all, I counted 14 or 15 items from last week’s distribution that went into this dinner. Nicki and Pat raved about it, and told us about the CSA they belong to in Melbourne. It’s winter there now, so they’re mostly receiving root vegetables. I confess to being kerflummoxed over the funky-looking fennel. There are lots of recipes for the bulb, an anise-tasting root that delightfully complemented my rolled pork loin. But recipes for the leafy fronds are scarce. However, I read that you can freeze them, so I did. I also learned that fronds can be used like dill – for example, salmon fillets marinated in a fennel-frond concoction. I obviously need to do a bit more research, but in the meantime my fronds are safely frozen. For a potluck dinner yesterday I roasted a melange of vegetables. Pattypan squash, eggplant, beets, carrots, turnip and radishes – all were roasted together for another vibrant dish of red, yellow, purple, orange and white. I did have some cucumbers left over, but I plan to make a batch of cucumber soup and freeze it. (I first need to check that this is doable.) I also ended up with three green bell peppers, which will be combined with peppers from this week and used to make stuffed peppers. Again, into the freezer they’ll go for some future no-fuss, tasty dinner. I’ve already arranged for our friends Fred & Barb and Alan & Deb to be the lucky recipients of some of today’s distribution because we’re leaving town later this week. I told them the two stipulations: you mustn’t throw anything away, and you must tell me what you did with the vegetables. Fred and Alan are both great cooks, so my expectations are high. Posted 8/24/2011 4:43pm by Vicki Phillips. I had plenty of opportunities to make good use of last week’s distribution because we hit the trifecta of social activities this past weekend. On Friday it was my and Ray’s turn to host our monthly dinner group, the annual neighborhood block party was on Saturday, and the Chatfield CSA potluck dinner took place on Monday. Plus, my sister Annette arrived Friday from San Diego for an extended weekend, a visit which engendered four solid days of raucous laughter and fervent cooking. But the first thing I did on Tuesday after picking up last week’s bounty was to prepare those scrumptious, healthy greens. Not sure how much longer they’ll last as we begin to receive more late-summer crops. Once again I just mixed them all together — beet greens, kale and spinach, braised with a tiny bit of drippings from some chorizo sausage. Also high on the "Eat This First" list (for the same reason) was the tender salad mix. Normally our dinner group is an elaborate production, especially for the host, who is responsible for entrée and sides while the guests bring appetizers and dessert. It doesn’t have to be elaborate, of course, but it seems we always try to outdo each other. But this time I eased up considerably. Why go overboard when we have all these fresh vegetables? Just let them shine, I reasoned. So early Friday morning I bought some fresh chicken, slathered it with a poultry rub and let it sit all day in the fridge. Just before the guests arrived I sliced the squash and eggplant vertically, drizzled them with olive oil and sprinkled kosher salt on top. Later they roasted in a very hot oven for about a half hour or so while Ray grilled the chicken. I also threw together a salad with our CSA tomatoes, cucumbers and basil. I added pieces of provolone cheese and some homemade croutons I had in the freezer, then splashed the ensemble with a little olive oil, balsamic vinegar, and salt and pepper. Like magic, the whole dinner came together with easy preparation and just a few ingredients. In the words of Henry David Thoreau, "Simplify, simplify." Normally my cooking routine entails dinners for just Ray and me with several items on the menu. But this week’s group activities required me to cook one dish for many people. This made it easier to use everything up. One strategy that helped was combining several vegetables together. For example, at Saturday’s neighborhood party my gratin dish with gruyere made an encore appearance, this time with purple potatoes, turnips and yellow carrots. What a colorful array! And for Monday’s potluck I caramelized our CSA onions, and in another skillet I sautéed in olive oil ALL the peppers — green and red bell peppers, jalapeno, Anaheim, Hungarian … all of them. I mixed the onions and peppers together and served them on crusty bread for a tasty, simple appetizer. Posted 8/23/2011 11:54am by Josie Hart. We will be in our original distribution location today, on the upper south end of the parking structure. It looks like the weather is cooperating with us! Please note that we will have peaches and plums this week for anyone who is a fruit share member. Also, last Thursday many of the members used boxes to pick up their produce shares which worked great for the heavier items. If you have an extra box at home please consider bringing it today for distribution. Posted 8/19/2011 3:52pm by Josie Hart. We’re officially halfway through our season! In the next week we will be sending out member and volunteer surveys so that you can let us know about your CSA experience this summer. We are also performing a cost analysis on our weekly share content to compare what you are spending with the CSA versus what you would be paying at the grocery store. Stay tuned for the findings; we think you’ll be pleased! We are happy to announce that we have donated over 1,500 lbs. of produce so far this season to local community-based organizations. This is just one of the many benefits that you, our CSA Shareholders, help bring to the greater community--THANK YOU! See details below about our CSA Member/Volunteer Potluck this Monday, August 22 and the Family Fun Night at Chatfield on Friday, August 26! The anticipated schedule for fruit distribution is listed below. If you have purchased a fruit share, please be sure to check in at the fruit share table at each distribution. You will check off your name and grab a bag (or two) of fruit. There is only one size for the fruit share so all shares have equal amounts of fruit. Please note that fruit shares were pre-sold at the beginning of the season and are no longer available for purchase. Combine all ingredients in blender. Blend slightly, until most ingredients are blended or in small pieces (some like it very blended until smooth). Place in a non-metal, non-reactive storage container. Cover tightly and refrigerate overnight to allow the flavors to blend. Toppings can include sour cream, chives, shredded cheese or croutons. You could also mound some cooked shrimp or crab on the top. The CSA potluck is this Monday, August 22. We will be in the Green Barn (big and red) from 6:30 – 8:30 p.m. Park next to the schoolhouse and walk over. Please bring a dish that will be enough for six people and a recipe if you want to participate in the recipe exchange. Also, please bring your own utensils, napkins, plates and glasses. Our horticulturist Amanda Wilson will be putting some beautiful bouquets together for the evening that we will raffle off to some lucky winners. All you need to do is fill out a mid-season member survey on how the CSA experience is going for you. Family Farm Picnic - Join us on Friday, August 26 from 5:30 - 8:30 p.m. for an evening of family fun at Chatfield. The Family Farm Picnic will be held at the Hildebrand Ranch and the CSA Garden at Denver Botanic Gardens at Chatfield. Families will enjoy evening farm life with the chickens and goats while discovering what kinds of tasty treats come from the CSA garden. Get up close to see insects, spiders and other arthropods from around the world as the Butterfly Pavilion presents a special Summer Bug Safari program. A light, garden-fresh snack will be provided. Families are encouraged to bring a picnic dinner to accompany the provided snack. This event is open to the general public. Cost: $20 member for a family of four, $3 for each additional person. $25 non-member for a family of four, $4 for each additional person. Free admission for children two and under. Please register online or call 720-865-3580 to reserve your family’s spot. Posted 8/16/2011 3:56pm by Vicki Phillips. On Saturday our friends Fred & Barb hosted a potluck BBQ. I’d been conceptualizing my dish for days. My vague notion of a potato-turnip concoction eventually took shape as a gratin. I printed many recipes I found online. But all day Saturday I simply could not motivate myself to cook. I devised all kinds of schemes to delay the project, including searching for B&Bs for an overseas trip we’re not taking till next spring. Finally, with about an hour to go, I flew into action, enlisting hubby Ray’s help as my sous chef. I decided to ditch all those recipes I found online and instead stick with Ina Garten’s tried-and-true recipe for cauliflower gratin. I made the cheese béchamel and began assembling the gratin. In went the parboiled potatoes and turnips. Then I threw in the radishes, also parboiled. And I had a little cauliflower left over from last week’s distribution, so I threw that in. A bit of parsley — it got thrown in, too. The result was a wildly popular gratin that everyone raved about. Afraid no one would like it because of the turnips, I found instead that every square inch of it got eaten and everyone wanted the recipe. On Friday we ate at one of our favorite neighborhood restaurants and had a divine appetizer consisting of eggplant, tomatoes and onions. It had a kick to it, probably red pepper flakes, and a very bright, fresh finish. In attempting to recreate this dish, I first roasted the eggplant, mixed it with tomatoes, onions, Thai basil and red pepper. I added olive oil, salt and pepper and — striving for that bright taste — finished it off with lime juice. It was quite good but not exactly like what we had. To be honest, I kept nibbling on the roasted eggplant while cutting everything else up … and I think I enjoyed the plain roasted eggplant more than the fancy appetizer. Come to think of it, several of our vegetables have ended up being prepared very plainly and were exquisite, no doubt because they’re so fresh. When cooking the green beans, for example, I nearly went apoplectic when I realized I had no bacon grease to season the beans with. (I’m from the South; that’s my excuse.) But they were superb without the grease! And of course every week I’ve been cooking the beets very plainly, as well as the spinach, and enjoying every bite. But on Sunday night I always do something more elaborate. This week, I used our bell peppers to make Rachael Ray’s lamb-stuffed peppers. For this dish I also made use of some of our other peppers and some of our herbs. It turned out fabulous. Dessert was white melon and berries, macerated in triple sec, sprinkled with orange zest and topped with cream. That melon is like ambrosia. It could’ve ripened a couple more days before I cut it, but still it was extremely sweet with almost a floral character. I’m looking forward to the watermelon, which should be good and ripe by now. Posted 8/16/2011 1:06pm by Josie Hart. Reminder: York St. members will be picking up their bags of fruit today. If you pick up your share on Tuesday at York St, please grab a bag of fruit if you are a fruit share member. If you pick up at Chatfield, you will collect your bag of fruit on Thursday, just like your veggies. The same distribution times apply to both locations. Posted 8/16/2011 10:03am by Josie Hart. Due to the forecasted rain this evening York St. distribution will take place on the bottom level of the parking structure. To access this location, enter the parking garage from York St. and we will be on directly to the right. Please bring $5 cash if you would like to purchase one of our fresh cut flower bouquets – as always they are beautiful this week!